The sidewalls for both of them are 50% of the section (205 or 215). 205/50 has a sidewall height of 102.5mm while 215/50 has a sidewall height of 107.5 mm. Apart from the sidewall height, the quality of Bridgestone Ecopia is causing all the issues. I have picked up ES Petrol Signature (Manual) last week (write-up in progress). I was curious to know what average are fellow owners getting? Any recent Ecosport buyers from chennai? I was offered the below quote from HANS Ford and it doesnt look VFM for me. Should i consider the Verna? You might be better off with Verna at the price of the S version of Ecosport. It is more comfortable and has similar goodies inside with the addition of air cooled seats - most important in Chennai. Seating in the Verna is also cramped for 5 so both cars are similar. The 1.6 L engine in the Verna should definitely be better than the Ford options. I got my S at 14L on road with 5 years warranty, so you can bring down the quote. This was in Pune where road tax is 14% (Chennai is 10% IIRC). The first item to target should be the insurance which will definitely be hugely inflated. Do also transfer you existing car's NCB if you can. Edit: Just checked and TN tax for vehicles above 10L is 15%, so check insurance and bargain for some cash discounts / free extended warranty. Last edited by fiat_tarun : 22nd October 2018 at 11:07. Cooling is fast and Effective. The strong AC has always been a plus in the Ecosport. I guess the AC is strong in the Figo twins too. It turns off the engine after idling for 30 minutes. Even if you disable it, it will reset itself to enabled next time car starts. Well it may not be relevant to this thread but couldn't find a better place to share it, so here I'm posting a video I found on youtube. Is this still a concern for ecoboost owners/buyers and do we have any official response from Ford regarding this. Infact is there any such problem with Ford ecoboost in India? Is this still a concern for ecoboost owners/buyers and do we have any official response from Ford regarding this. Infact is there any such problem with Ford ecoboost in India? This is really shocking ! Never imagined a popular car like Fiesta ST to be plagued by these issues In India the 1L Ecoboost is perhaps the least sold variant and now its available only in one trim. Completed the first service on my Ford EcoSport S (1.0L). Car has been running fine except for the sunroof rattling sound from Day 1. After many months of enduring that nuisance, I wanted to get rid of this issue. I had been following up with Ford customer support & Bindu Kumar (service manager) from the beginning and they agreed to look into it at the time of first service. I took my car to JSP Ford CK Palya branch (near Bannerghatta Road). The service manager, Mr. Tharesh was aware of my problem and promised to resolve it. The question of whether I would be charged for it was running in back of my mind. 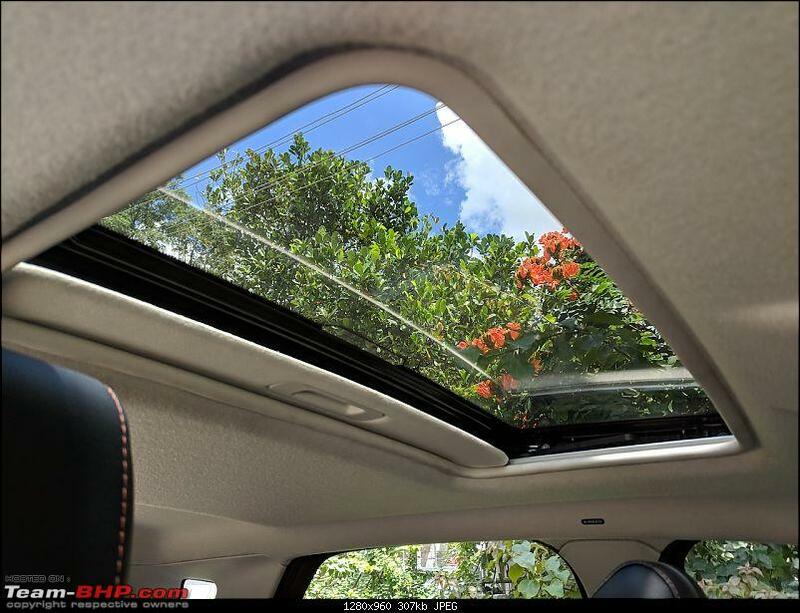 After a day, I got a call from Tharesh stating that they are going to replace the entire sunroof assembly free of cost. However, the parts had to come from Chennai, so I had to wait for 4 days to get my vehicle back. On the delivery date, I went for a short test drive and confirmed that the rattling sound was gone. Nothing else to report about the first service. They didn't change any lubricants & I wasn't charged anything. Car was cleaned well and felt like brand new. Many weeks later, I'm happy to report that I always ride with the sunroof slider open to let sunlight in (but window closed though to avoid dust). No issues with vibration / sounds whatsoever. Engine has gone past 4k kms now. Just recently, I faced my first puncture. 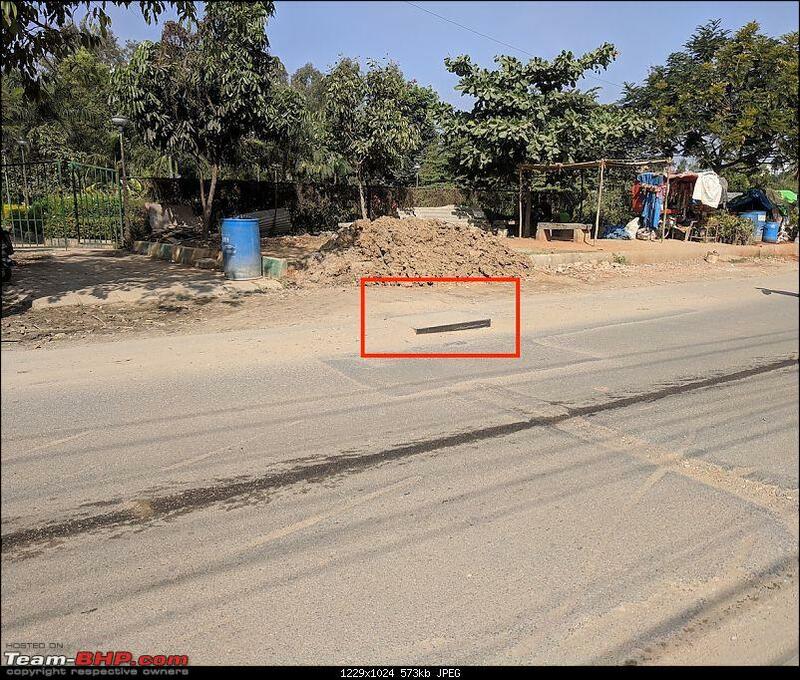 In addition to its infamous traffic, Bengaluru is also known for its terrible roads. 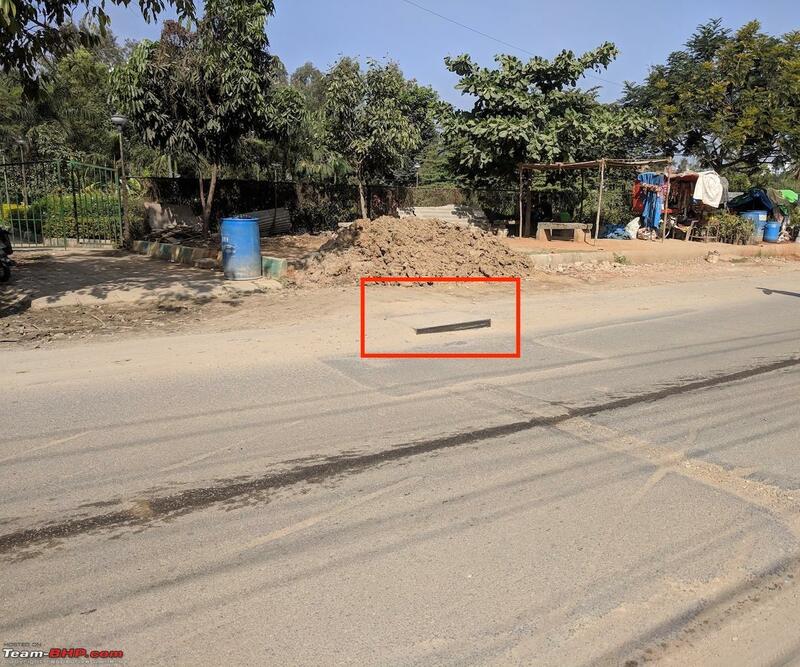 Due to some recent works in my area, roads have been dug up. There's a sewage water lid with the edges protuding out just outside my apartment gate. As I was taking out my car on a busy workday, the front left tyre scarped one of the edges. I heard a thud when it happened. At first I suspected I hit the underbelly of the car, and then wondered what could get through 200mm of ground clearance. Just when I started suspecting I hit something against the tyre, the TMPS issued a warning about low tyre pressure. It shows the front left tyre was rapidly losing air pressure. My heart sank. Somehow I managed to park by the side of the road and inspected the damage. The sidewall was clearly damaged and I could see that the alloy was dented too! I was wondering how did this happen. After the initial shock, I fixed the spare, and then went off to Tyre Empire to see whether the tyre could be salvaged. Since the damage was on the sidewall, there was nothing that could be done. Worse they didn't have the same tyre in stock. I called Bindu Kumar who had helped me earlier with my sunroof problem. He asked me to come to his service center at Kudlu Gate (near Haralur Road). On reaching there, he came to the same verdict that the tyre had to be replaced. On my request, he tried to see if this could claimed under warranty. 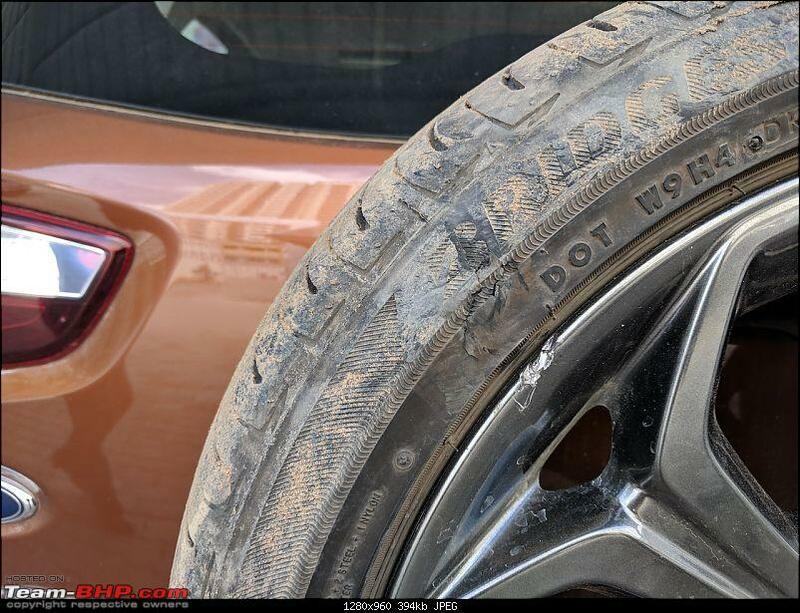 Unfortunately since the alloy was also dented, there was clear indication of external damage, so no warranty could be entertained either by the manufacturer or Ford. Left with no choice, I went ahead with the tyre replacement. Total Cost - Rs. 8764. Yup, 17 inchers are expensive! Was a shame really considering the tyre had barely completed 5k kms. Last edited by Vid6639 : 22nd December 2018 at 16:47. Drove from Bangalore to Chennai during evening hours for the first time. Started at 5pm and reached at 9:15pm, with a total duration of 5 hrs 15 mins, no break in between, covering 300+ kms. Maintained average speed of 100kmph, with some spirited runs in between easily touching 120 kmph. Overall, the engine performance is great, with strong acceleration when in the right power band. I'm also happy with the NVH levels thanks to the refinement of the engine. Incidentally, I breached the 5k kms mark with this drive! 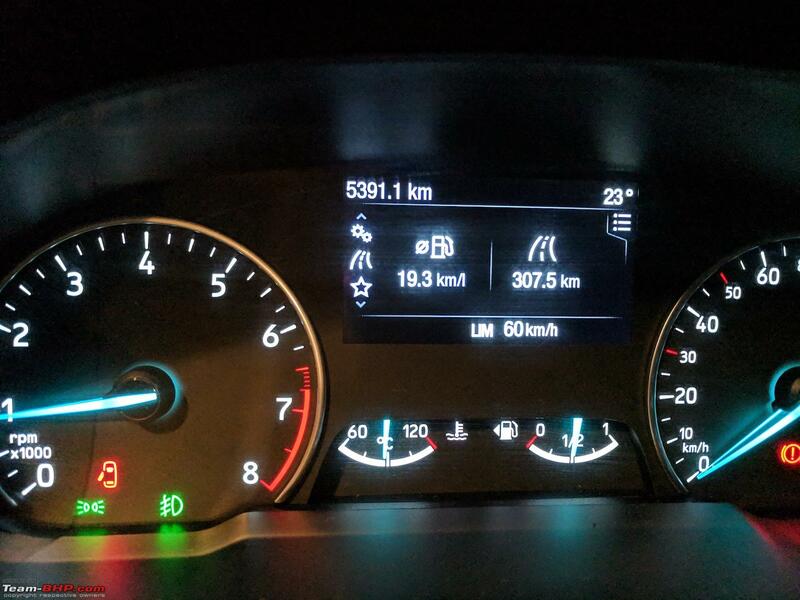 On the way back to Bangalore, I did an economy run with a mileage of 19.3kmpl (!! ), which is my personal best on a petrol engine. Maintained a speed of 80kmph with cruise control at 6th gear for most of the trip. I was able to touch 21kmpl halfway through the trip, but as usual the choke points in Hosur and toll gates had me slow down to lower gears. Those are good FE figures and I've personally got excellent FE when driving this engine sedately. I own a previous gen Ecoboost and the FE I've achieved at times can shame some NA 1.2 petrol engines. 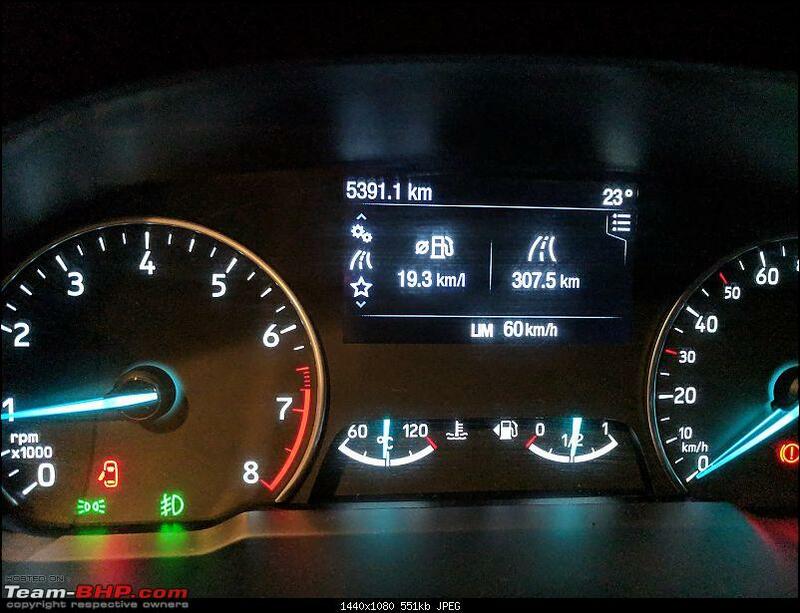 But its is way too sensitive to throttle inputs and the best figures are seen at 80 or 90 kph. The only sour point of this engine is low end torque which seems to have improved in the new iteration that you own. I'l soon be joining the club with a Smoke Grey bad boy on the way . Had a question, does the glove box have a cooling vent by any chance, read that in drive spark's review of the Ecoboost, though I haven't seen any pics of it. Thanks for any clarification, safe drives! I have EcoSport S TDCi version, manufactured in September, 2018. I do not have a cooled glove box in my car. Please let me know if anything new comes up. O.T. I have read in the forum, older car's cooled glove box wasn't that effective. Congratulations on your new acquisition mate, happy and safe motoring! Last edited by RedStallion : 13th January 2019 at 14:30.